You are here: Home / Prayer / Is There Any One Right Way To Pray? Is There Any One Right Way To Pray? Do you ever wonder if you’re praying the right way? Are you using the right words, the right motions, the right methods? Are your attempts at prayer good enough for God to listen? “Is there any one right way to pray?” I heard this question from a new Christian who was struggling to figure out prayer, but it’s one I’ve also wondered myself. So many guides and instructions on how to pray, but which one is “right”? Do I close my eyes or open them? Do I kneel and bow my head or look up at God? Should I be praying the written prayers of the prayer book or making up my own? What about some of other methods, like praying through art or movement? Are those really praying? What do I need to say in my prayers? Do I need to use the big “church-y” words or are my own enough? Aren’t there some rules I’m supposed to follow? Where do I start? What about you? Do you ever wonder if you’re getting it “right”? Wonder if you’re praying the “right” way? What are the essentials for prayer? Should we follow certain rules and guidelines? To answer this question, I went in search of what Jesus taught about prayer and examples of prayer captured in scripture. When Jesus taught about prayer, he was more focused on the state of our heart and our intent for prayer, rather than the form and content of our prayers. He did provide some content structure through the Lord’s Prayer, but his teaching primarily focused on coming to God with a humble and forgiving heart, ready to include God in all our conversations, needs, and decisions. As long as you approach God in these ways and open your heart to Him, there is no one single “right” way to pray. Why So Many Methods For Prayer? Over time, Christians have found numerous ways to approach God through prayer. Some people are great at just sitting down and entering into a prayer conversation with God, while others need more structure and guidance. God designed us each with different communication and learning styles, so the way I pray best may not be the optimal method for you. Perhaps you’re wired for the written word, either to communicate through reading or writing. Maybe you’re more wired for oral communication. Some of us love silence, while it makes others uncomfortable. Others of us are wired more creatively and communicate best through art or music. Sometimes we need movement to help us focus and communicate. Other times, we need the language of scripture or the words of others to expand and enhance our own prayer language. As you explore different methods for prayer, you’ll find a combination of these that work best for your prayer life. You’ll find one or two methods as your “go-to” for everyday prayer. You may have another couple that you use when you really need to seek and hear God’s guidance. You may have another for when you simply want to praise and worship God. Then, there are the ones you use to shake things up a bit and reignite your prayer life when your prayers begin to feel lackluster. You’ll develop a different set of preferences as you explore the various prayer methods. Find ones that work best with your communication and learning styles. God made you unique and wonderful and He will receive you in the prayer forms that work best with how He created you. The best way to find the prayer methods that work best with how God designed you is to try them. 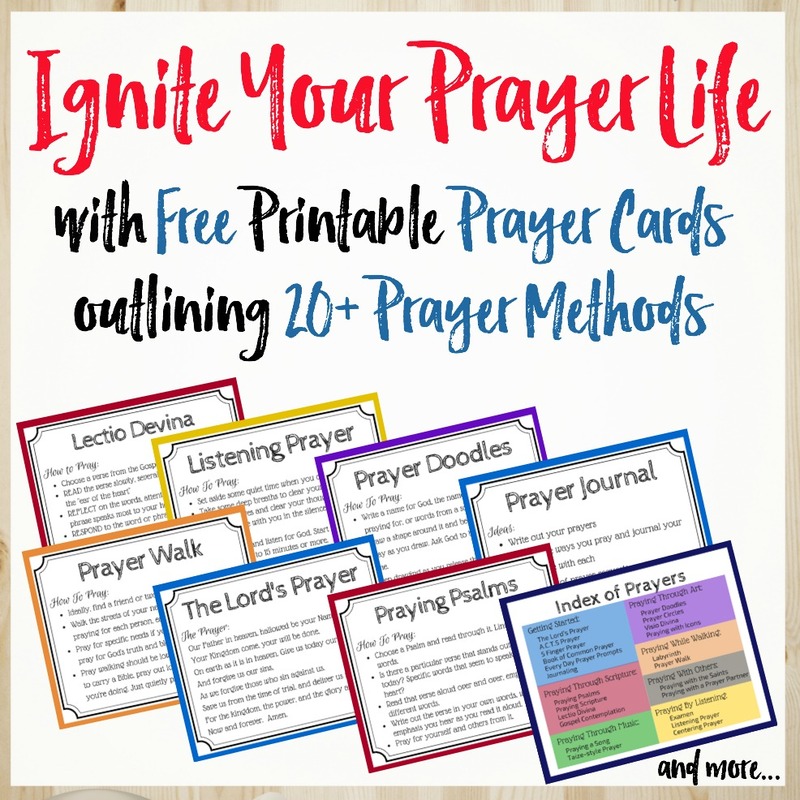 Explore the various prayer methods and see which ones fit best for you and help you connect with God in your prayer time. Don’t be afraid to try something new. You just might find a new favorite! Your preferences may even change over time, so periodically try some of the methods again. Variety keeps your prayers fresh and focused. I have researched and written on a number of prayer methods. Below are links to learn more. For a more convenient, printable format, grab a copy of my new Prayer Toolbox, a reference guide for your prayer time detailing 16 of these prayer methods, including over 50 ideas for how to incorporate these into your daily prayers. What Are Your Best Prayer Methods? Thank you for sharing this! God has designed us all uniquely and thinking about those differences and your various ways to pray truly makes sense! So glad I clicked over to read! Pinned to my prayer board on Prayer too! Not sure if this comment will be a second one… maybe a glitch? Not sure! Anyhow- thank you for sharing this! God has made us all unique and different and these are such wonderful ideas of connecting to our Heavenly Father that correspond to how we speak and hear.